Fundamental to design is understanding the desired outcome and the budget, so fully discerning the ideas of the client along with assessing the existing site conditions is essential to creating the optimum new play environment. Whether it is complete design build of a play area or the layout of line stripping on asphalt, our design team has the creative and practical skills to do a complete master plan or simply design elements to enhance your existing play space. We can add to the play value of the playground with individual or composite play components as well compliment the area with natural features such as sand & water play, landscaping, boulders, logs, organic pathways, garden areas and more. Our Autocad drawings provide a scaled plan with comprehensive details of specific areas. We offer many products or work closely with vendors to provide the most appropriate equipment and best pricing. We can propose or recommend high value Play Equipment, Shade Structures, Shade Canopies, Site Furnishings, Picnic Tables, Benches, Water Play, Safety Surfacing and many other items related to recreation and play. We have extensive experience in the installation of all types of play and recreational equipment. We pride ourselves on the quality of our service with a partnering relationship of cooperation with the client. We can solve many of the common and challenging site issues if they arise prior to beginning the job. Our crews are highly experienced, and use the latest tools, equipment and safety practices. When site preparation is needed, we bring experience and skill. For layout, demolition, grading, site improvements such as compacted fill, concrete features or construction our crews deliver the exacting specifications needed for the job. Our equipment and crews have many years of experience with play area improvements and deliver an excellent finished product. Repair and maintenance are considered a high priority by us since both are critical to a safe play environment. We can evaluate problems with our vast knowledge of play equipment and current products. Our goal to control the integrity your playground in a safe condition during any needed repairs or maintenance. 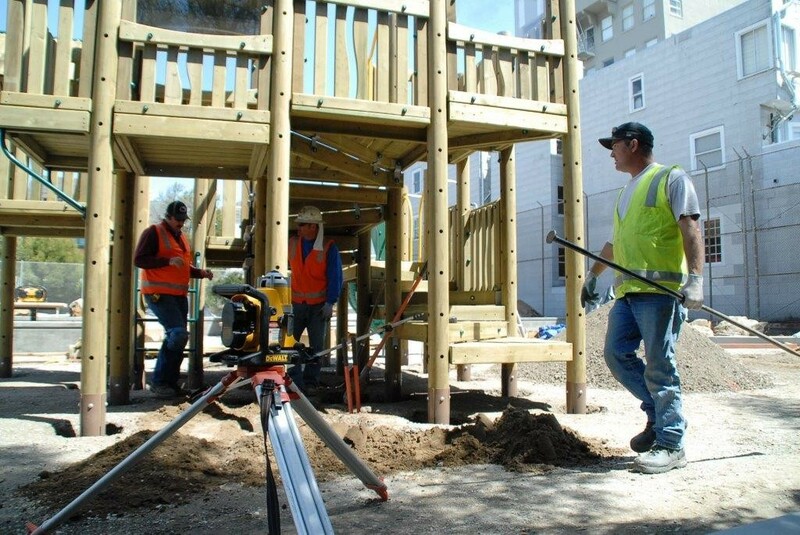 Community Playgrounds has relocated hundreds of play structures and related apparatus for schools, parks, child care centers and others using the techniques and skills to preserve the material quality of the equipment and save significant costs of new equipment. If your program requires relocation, please contact us for the benefit of our experience with cost saving ideas and consultation for economical improvements to maximize the play areas at the new location. Often removal of play structures is required for various reasons. We do removal of any type or size of play or recreational equipment with utmost care to the existing site while recycling the materials to the appropriate agency to prevent adding to land fill.